MWEdit is an alternate editor for Morrowind that is similar in form to the Construction Set but with many additional features that make it easier to use. Standard multiple document interface (MDI) allows editing of several plugins at the same time. More gracefully handling of errors (missing IDs, files, etc...) rather than simply terminating. The current version simply ignores most errors. Load times are much faster than the TESCS (roughly half the time). All master files are only loaded once per session so once you load Morrowind.esm the next time is almost instant. Currently you must exit the application to clear the master data if required. Records can be permanently 'cleaned' from the active plugin easily. This includes INFO records and cell reference sub-records. Edit records by double-clicking in all lists (NPC inventory, containers, leveled lists, etc...). Toggle viewing of only modified items. Copy or rename most record types. Optional incremental backup plugin on save (PLUGIN.ESP.001, PLUGIN.ESP.002, etc...). Standard 'Save As' file menu added to change the saved plugin filename. Records can be dragged in many situations to copy that record (for instance to/from cell reference lists, containers, leveled lists, inventories) or between different plugins. Find a text string in all records. You can double-click a record in the result list to edit that record. The last ten searches are saved. Display all objects that use a particular record (like the Info comment in TESCS). Compiled scripts and dialog results are included in the search. New icons for all item types. Set a default author name for all new plugins. Export/import items to standard CSV files. View exactly where a record is used in the currently loaded records. Find object references in dialogue results and scripts. 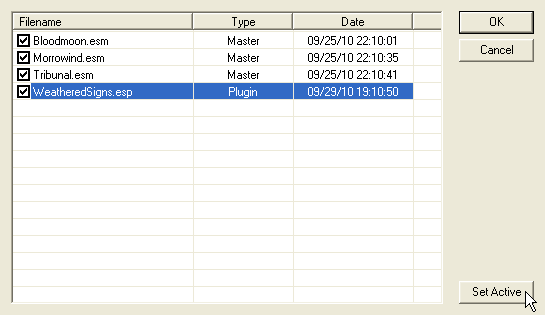 Extended load dialog with a sortable list showing the plugin name, type, and last modification date. This makes it much easier to find the plugin you want. Displays ESS save games in the file list. Open plugins from the default Morrowind installation or a custom game path. Item tab control has been changed into a list. This makes viewing a certain item type easier. Almost all item types are viewed and edited in the list view (such as scripts, globals, etc...). Each item in a plugin will have one edit window open at a time (unlike the TESCS where you can open multiple windows for a single item). Consistent design of the item windows. Color coding of active (green) and deleted (red) records in all lists. Records can be sorted by their modified/delete status in all lists. The sort field and column widths for each item type is saved and restored when you leave and return to that item type. Copy and rename dialogue topics, including all the child INFOs. Change position of a dialogue responses Up/Down in the list. Copy dialogue responses (within a dialogue). Display of INFO function values in the dialogue list. Values display not only the function/ID for the function, but also the value compared against allowing one to quickly gather more information at a quick glance. Resizable dialogue and info windows. Using the standard cancel button in the dialogue window cancels all changes to INFOs of the dialogue. Color coding of script code. Use a default white or blue color scheme or use any custom colors to identify the various word types. Can also be disabled. Select the font used in the script window. New script compiler reports many more errors and possible errors. Three levels of warning/error messages (weak, default, and strong) allowing you to set how many compiler messages are recorded. Compiler adds spaces to the script output where they might be required or expected (such as in if statements). Object types used in functions are checked more rigorously. If the function expects an NPC ID, you'll receive an error/warning if you use another type. Compiles script on save automatically (no warning/errors displayed). Export and import scripts to/from text files. View detailed help on all script functions. All compiler errors/warnings are displayed in a splitter pane at the bottom of the script window. Double-click a message to jump to the location of the message. View detailed information on compiler messages and display the function help if the message is related to a specific function. Compiler does not permit the use of reserved words as local variables (such as end, X, Y, etc...). Functions that are known to be broken will result in a compiler message. Simple function tooltips can be displayed for faster scripting. Custom functions, such as those used in MWSE or MW-Enhanced can be defined in CustomFunctions.dat and compiled in the script. Scripts can be compiled without loading the master file even if the script uses external records such as player by using the Extra File option. The Extra File is a plugin file (MWEditExtraFile.esp by default) that contains all the common records you need. Easier editing of item counts in Containers and Leveled Lists (use +/- to modify the count as well as the regular edit). Supports the selection of multiple items. When an object ID changes when editing a record, you have the option to Rename, Copy, or Cancel. Copy the downloaded plugin and its associated folders (typically a Meshes and a Textures folder) into Morrowind's Data Files folder (This will be C:\Program Files\Steam\steamapps\common\morrowind\Data Files\ if you have the default Steam setup). Go to View->Options. In "Game Data Path", browse to Morrowind's data files (e.g. C:\Program Files\Steam\steamapps\common\morrowind\Data Files\). Then click OK. Highlight the Plugin filename and then click the "Set Active" button. This changes its Type from Plugin to Active. Click OK.
After everything has loaded, click File->Save As, then choose OK to overwrite the original plugin. If it tries to save it as noname0, it's because you did not make the plugin active. This page was last modified on 3 May 2013, at 22:08.